Suffice to say, Stephen King is just messed up. In a good way I guess. Not too sure. Now that I think about it, I did read Carrie after lights out on my top bunk in high school. And I was freaked out. I read part of it. Not sure why. All I know is I was in form one, it belonged to someone who took it back and I never read much non academic books after that in high school. 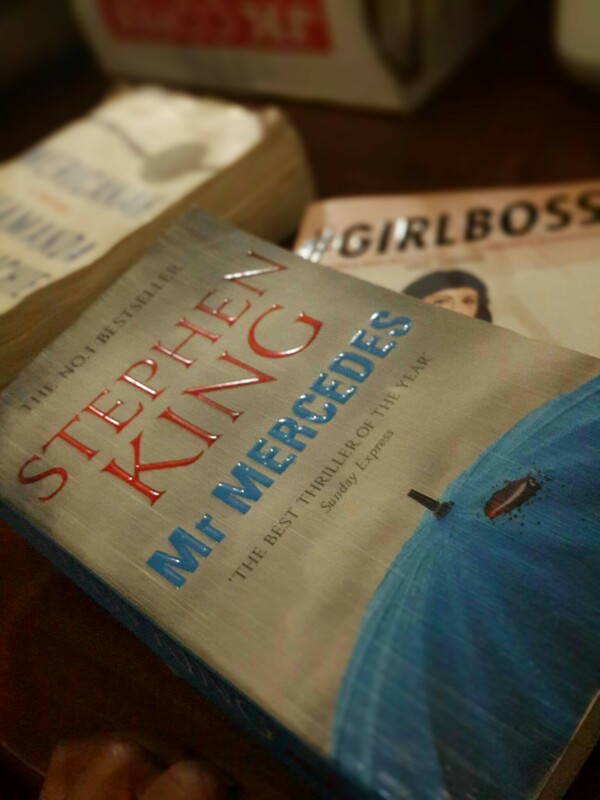 I am still reading Mr Mercedes. I would have finished it already if I was not such a pathetic reader. I am yet to finish Steve Jobs, mostly because I fell for The Martian while still reading. I am still reading The Martian, lest you’re mistaken. I don’t know why I do this to myself. But really, I do know. I read The Martian in the dark because it’s a Kindle edition. Or on a bus with green light like this one. I can’t read a physical book on such occasions. Plus the reason I am reading too many books is because books tend to bore but me before the real action starts. Only the books I’m reading get boring every once in a while. Then they get exciting. When I’m in bed. About to sleep. When I should be asleep. When I need to be up early. Then I sleep and forget. Then I continue with another. Because I can’t just read a book all day when there’s a life to live and a husband to find. Lol. Yeah, I’m beginning to sound pathetic with these husband lines, right? Whatever. Anyhuuuuu, so I’m reading all these simply because Divine Secrets of the Ya-Ya Sisterhood didn’t get to any interesting part. Mostly because I am not American, I think. Will revisit it later in future. Just in case you’re there thinking that’s all I am actively reading, think again. Yesterday I walked into Text Book Centre at Garden City Mall and there it was, right there, #GIRLBOSS. (Mtajuaje nilifika Thika Road finally?) It so happens that the book I was looking for in the first place at Sarit Centre when I got Mr Mercedes was this one. So yeah, I am reading this cray book too. Because I am a girl. Because it has not got to the point it has pissed off this rational feminist. Because it’s not Lean In. I have always said I will not read Americanah. I simply don’t get Chimamanda. But like I have told you before, I have the best colleagues. So one left the book behind for me during my leave, just like she promised. No I am not adding a tenth book to my currently reading list, I ain’t cray. Fine, maybe a little. So I’ll wait till I’m feeling Nigerian. No more books. I will tell you about them all soon, and whether you should read them if at all you should be taking advice from me. Like I said, cray me. Here I am now, inevitably writing. So you can very well say reading has not stopped me from writing. Also, if you have never watched Scent of a Woman and call yourself a movie fan, you’re terribly lost. There’s something about movies from the 90s. They have some the most epic speeches. I had ignored that movie because of the title. I honestly think the title is completely misleading. Al Pacino makes this speech at the end that will make you wonder why you don’t stand up for stuff when you should. Great stuff. Won’t spoil it for you. The avalanche of posts will, after all, proceed. All the posts stored up from leave are on in my head, waiting to be spilled out. Watch this space for more pointlessness. ? At least now I know there’s someone who doesn’t finish reading these books an they get another. Been reading “Cloud Atlas” since early this year. Hang that. Now I’m on to “Wizard’s daughter” by Catherine Coulter. In the meantime I’m trying Steve Jobs. Could you pass it when done ?? Never even tried Ludlum except the movies. Well, this post is cray. And I read it all the way to the end. Waiting for the avalanche. (I could, but I’m too lazy to write about the long list of books I’m currently reading. Currently being as far back as January. The stack besides my bed is getting higher. I do wipe the dust off them once in a while so… I care. Hehe. Avalanche already in progress. I must be the weird one. ? Y’all are reading such ‘good sounding’ books. Me? Salt, Sugar and Fat. How The Food Giants Hooked Us. Heretic. Why Islam Needs a Reformation Now. Guess I am kaodo violent somewhere within. Or maybe I just like the action. Kaodo violent. Loooooooooooool! Literally laughing out loud!